My "Lefebvre" family name is richly weaved into the history of professional sports in the U.S., appearing for nearly 100 years from the east coast to the west. 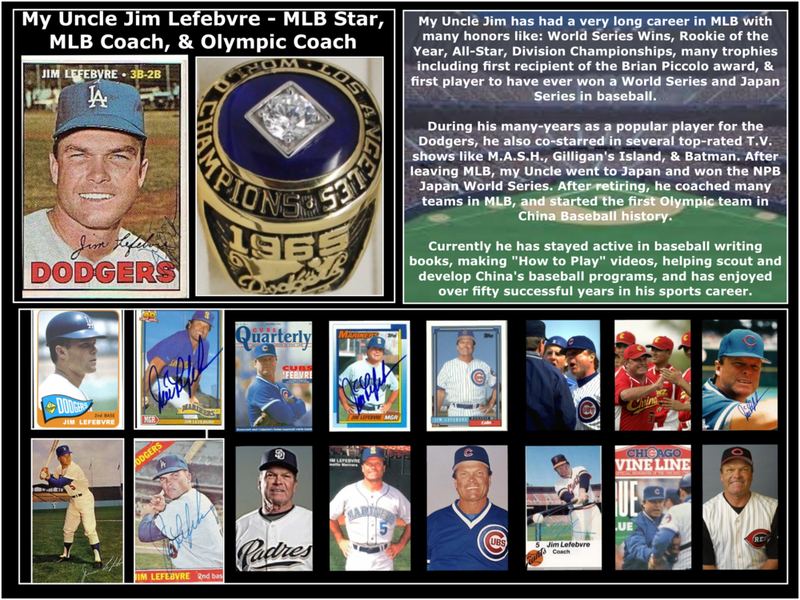 Over twenty of my Lefebvre family relatives are listed on the rosters & in the history books of the MLB, NFL, Olympics, AFL, NAVY Football, and Universities like USC, UCLA, and Pepperdine as Athletes, Competitors, and Coaches. My family has also had numerous other roles in the world of sports, such as writers, MLB Radio & TV broadcast announcers, and inventors. When you look up the name "Lefebvre" in sports you'll see names like Alfred (Al), Jim, Gil (Gilbert), Ben (Benjamin), Henry, and the list goes on. I understand better than most the tradition of being an Athlete, Competitor, and Coach. Listed here is just a brief summary of some of the accomplishments of my immediate family, like my father and his two brothers, and my grandfather and two of his brothers. 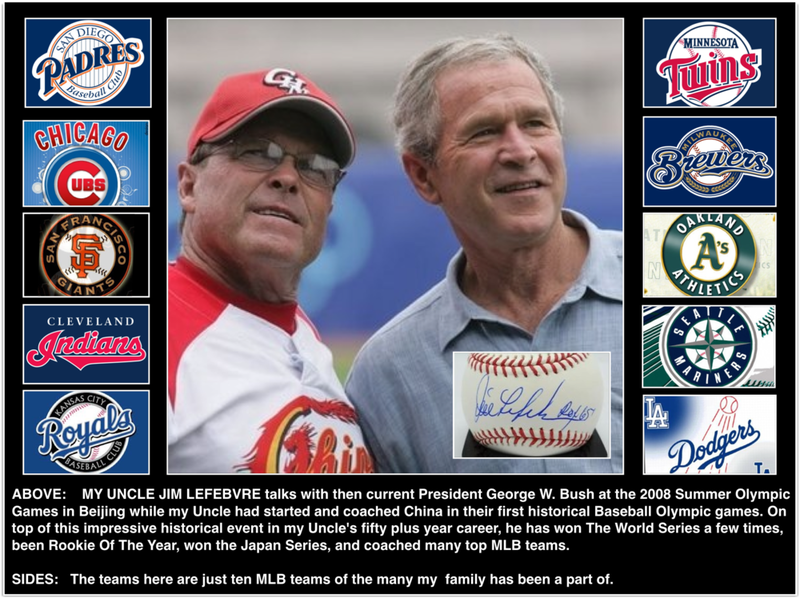 This will give you a small snapshot of my family's proud history in sports. We've been part of several MLB baseball teams, including the Chicago Cubs, San Francisco Giants, LA Dodgers, San Diego Padres, Oakland A's, Seattle Mariners, Milwaukee Brewers, Cleveland Indians, Minnesota Twins, and Kansas City Royals. Rookie of the year, World Series Wins, NFL longest all time Punt return record of 98 yards for over 60 years, National Championships, American Legion National Championships, National League All Star Team, Japan Series Win, first ever Brian Piccolo Award Recipient, developing & coaching the first China Olympic Baseball Team. We also played for some NFL teams, including the Cincinnati Reds, Detroit Lions, and many more throughout the past 100 years. We pioneered the Pacific League and AFL, like the Los Angeles Bulldogs, Hollywood Stars, and Los Angeles Maroons, all semi-pro and pro teams before the NFL franchised to the west. Having this long family tradition gives me a special, unique understanding when training. I am flexible enough to handle beginners all the way up to pro level athletes. 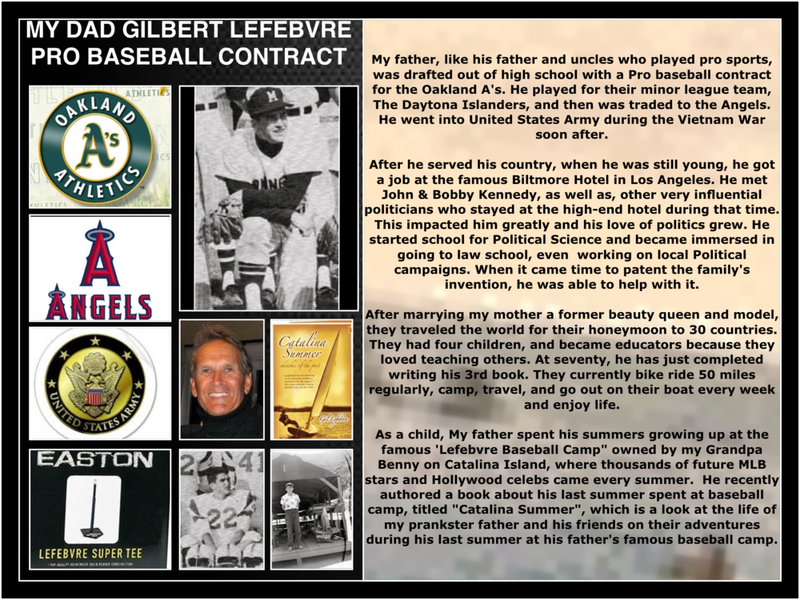 My grandfather and uncle owned the famous "Lefebvre Baseball Camp " on Catalina Island in the 1950's and 60's, where all the future MLB stars and celebrities would go each summer to learn from my grandpa Benny. Thousands of students came through the camp, even some MLB teams having training camps their. After my Grandpa's success with playing semi-pro football and baseball, he started coaching at the high school level, many students going on to the major leagues. Names include: Billy Consolo, Norm and Larry Sherry, Don Buford, the Lachemann brothers Marcel & Rene, and Sparky Anderson, along with his own three sons who all signed pro baseball contracts. The camp was packed every summer with the who's who in the up-in-coming baseball stars, including the Wrigley Family, who had a place on Catalina Island and hung out there, along with many other Hollywood celebs & starlets during the camp summer season. The Chicago Cubs even had their training camps at my Grandfather's camp. My great Uncle Henry even scored the first ever touchdown at the LA Coliseum. All this as well as many other awards, books, and patented inventions that changed sports into what we see today. 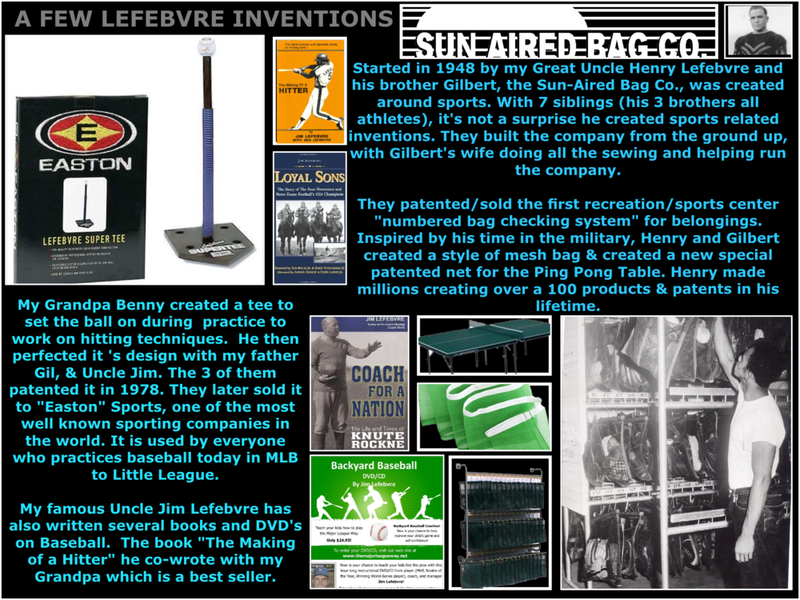 One of my grandfather's inventions, used by anyone who plays baseball today, is the "Lefebvre Baseball Tee." He invented the device and patented it with my father and Uncle, later selling it to Easton, one of the largest sports companies in the world. It now sells worldwide to every major, minor, and little league team today. Henry invented over fifty things in his lifetime and is most famously known for his redesigned and improved patented invention of the Ping Pong net. I know how to take any individual and customize their training, diet, and discipline to reach any goal. It has been a family tradition and an honor to pass down & share this knowledge of helping people get healthy, compete, and better their lives. It is amazing to be a part of a family that played with the greats like Sandy Kofax and coached some of the best in the business like Sparky Anderson, who mentioned my grandfather Benny when being inducted into the hall of fame. My family has a deep pride when it comes to sports, even writing top rated How-To books like " The Making of a Hitter," as well as currently having two baseball training schools owned by my cousins and several generations of dedicated Military service.